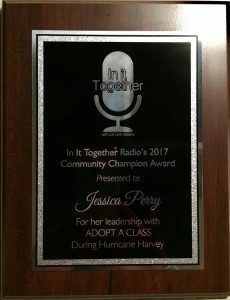 My idea behind the adopt a classroom project for classrooms affected by hurricane Harvey was to show my students that there is no limit to how far their kindness can spread. To do this, I wanted my students to “adopt” a classroom in Texas where they would make encouraging cards and put together small goody bags for the students as a way to show them that we were thinking of them, and to put a smile on their faces during such a scary and confusing time. I posted this idea in a teacher facebook group hoping to find a classroom to adopt, and it took off. I immediately began receiving hundreds of messages over the next few days from fellow teachers looking to also adopt a classroom, and teachers affected by the hurricane wanting to be adopted! It was an incredibly humbling experience to see so many people pulling together to spread a little bit of kindness to these kiddos in Texas. In the end, about 600 classrooms had been adopted and 15,000 kiddos received a kind note and goody bag from another student somewhere across the country!! Many of these adopted classrooms also received boxes of school supplies, gift cards, etc. to help them rebuild what they had lost.